For decades controversy over the role played by the Communist League in the revolution of 1848-49, questioned whether the league was the most clear-sighted and decisive force, wheather it influenced the extreme left wing, or whether it was completely drowned in the general democratic movement. Thus the question is whether it had any specific influence whatsoever. The answer to this question is impossible merely on the basis of the period of the revolution, but only in contrasting them with the history of the league since 1836. In a complicated process of secession from the petit-bourgeoisie democratic League of the Proscribed between 1836 and 1838 in Paris, the first independent German workers' organization was established under its original name of the League of the Just which was closely related to Blanqui's Société des Saisons until 1839, when it went its own way. Wilhelm Weitling's utopian communism initially exerted a decisive impact but, after 1842, the ideas of Robert Owen, Ludwig Feuerbach, Moses Hess and others were also integrated. The organization of mainly German journeymen gradually spread over Europe and to the U.S.A. In 1840 the famous Communist Workers' Education Association was founded that existed up to 1914, with branches in Switzerland, Germany, Sweden and in other countries. The League increasingly assumed an international character. After establishing casual contacts with the League of the Just in 1843, Marx and Engels in conjunction with Wilhelm Wolff and several others tried to gather all socialist and communist forces into a communist correspondence committee in Brussels in 1846. At the same time, insufficient programatic and theoretical foundations with resulting uncertainties concerning topical political issues and indecision on organizational matters had brought on a crisis in the league. By mid-1846, the seat of the central executive was shifted from Paris to London and cooperation was intensified with the Brussels committee. At the beginning of 1847 Marx and Engels joined the League and began to play a decisive role at its congresses in London of June and November-December 1847. At these congresses the League of the Just was transformed into the League of the Communists, the first modern, largely Marxist workers' party, with its program, the Manifesto of the Communist Party. As reflected in the Manifesto, discussion at the second congress focused on the possibile imminence of a bourgeois-democratic revolution, with Germany being the most likely field of action for the league due to several factors; thus popular forces should concentrate on the major enemies of the revolution - tsarist Russia, the Hapsburg monarchy and Prussia - and the bourgeois revolution should be transformed into a proletarian revolution, in a permanent process. Thus , when the revolution broke out at the beginning of March, the League of Communists had adopted the c oncept inspired by Marx. Marx decisively decisively export of the revolution from France, but members of the league were actively involved on the February barricades in Paris and in the struggles and demonstrations in Neuchƒtel, Berlin, Stockholm, Amsterdam, London and elsewhere. At the end of March 1848, the central executive published as a leaflet the seventeeen Demands of the Communist Party of Germany which were designed to guide the several hundred members of the League who ret urned to Germany individually. However, when it became clear that the German bourgeoisie, fearing the emerging working class, was reluctant to take over the leadership of the revolution against the feudal forces, and when the organization of an association of the local workers' unions ran into considerable difficulties, the executive of the league decided in May 1848 to stop most internal-organizational activities, to support temporarily the extreme democratic left wing in the. 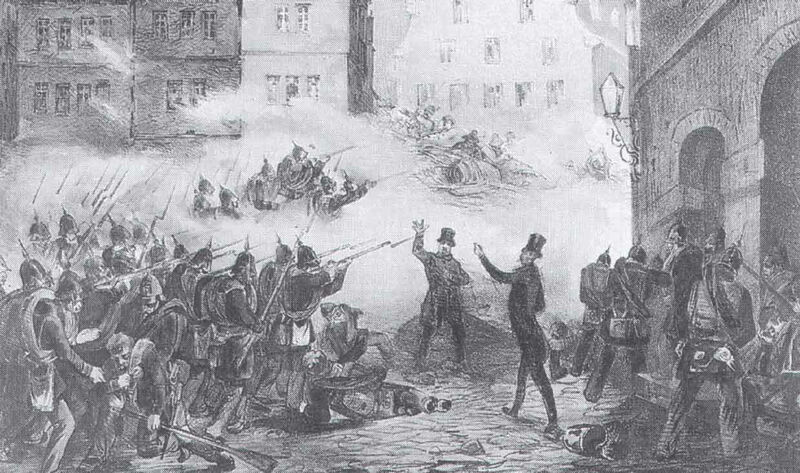 By the end of 1848, these tactics together with Marx's brilliant journalism in the paper helped to found an independent workers' party jointly with the German Workers' Fraternization under the influence of Stefan Born; the new organization might have provided the impetus for the revolution, but the founding congress never convened in Leipzig in June 1849. In the meantime, the counter-revolution had consolidated itself throughout Europe, so the members of the League could only play an minor role in the armedstruggles waged by the German constitutional campaign from May to July 1849. With the defeat of the revolution a great number of members of the League of Communists, were arrested or were forced to emigrate from Germany, and later from France and Switzerland as well. In most cases they went to London and to the United States. Just as the preparations for the revolution had largely dominated the League's activities since its foundation and the 1848 revolution had marked the highlight of its history, the evaluation of theory was important from the revoluton to about 1852. The Neue Rheinische Zeitung - Politisch-ökonomische Revue (Hamburg 1850) published a number of historical analyses by Marx and Engels which developped the concept of scientific socialism. Within the League, there were factional disputes and discussions of questions like the preconditions for revolutions and the relationship between bourgeois and proletarian revolution. Marx, Engels, Eccarius, and others emphatically opposed by-passing objectively necessary social stages of development, hostility to intellectuals, adventurism, and the tendenct to militarize the revolutionary movement. The experience of the 1848-49 revolution, specifically the activities of the Communist League, were of paramount importance for a great number of the participants in the workers' movement and for the development of socialist thought in the second half of the 19th century. Der Bund der Komunisten: Dokumente und Materialien, 3 vols. Berlin 1970-1984. Friedrich Engels "Toward a History of the Communist League" Collected Works XXVII and Karl Marx and Frederick Engels Selected Works, Moscow, 1962, II. Herwig Förder Marx und Engels am Vorabend der Revolution: Die Ausarbeitung der polit ischen Richtlinien für die deutschen Kommunisten (1846-1848), Berlin 1960. Gerhard Becker Karl Marx und Friedrich Engels in Köln 1848-1849: Zur Geschichte der Kölner Arbeitervereins. Berlin, 1963. Martin Hundt (ed.) Bund der Kommunisten 1836-1852, "Studien-bibliothek DDR-Geschichtswissenschaft: Forschungswege, Bilanz, Aufgaben" IX, Berlin 1988.